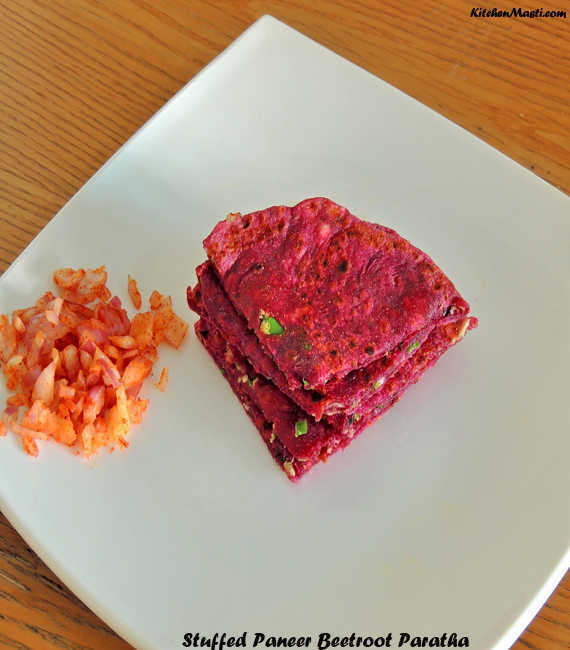 Stuffed Beetroot Paratha with paneer and chillis is an excellent breakfast recipe which is both eye catching and appealing. 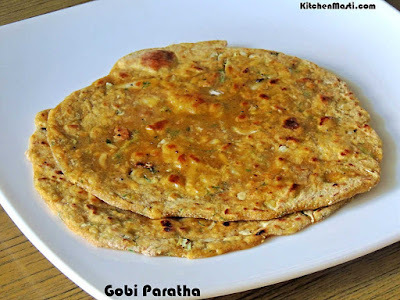 I have already posted many varieties of stuffed paratha recipes in my previous blog posts and this is an addition to the collection. 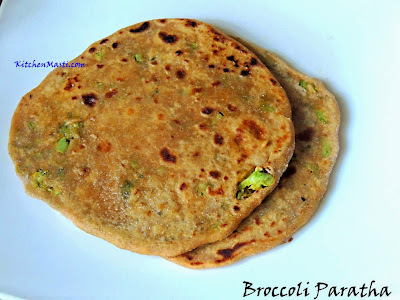 I happened to see this recipe in an old magazine and the author named this recipe as princess paratha and to be frank the taste of the paratha is so tasty and tempting that it is simply irresistible. The cottage cheese and green chilli stuffing spike up the taste. Here, we mix flour with beetroot puree and prepare a dough. Later on, we stuff the parathas with paneer. 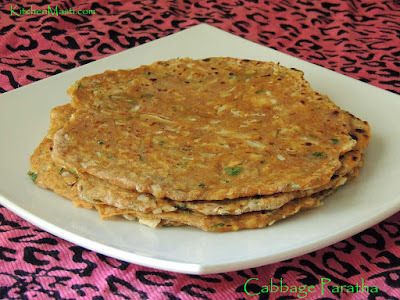 This paratha is highly nutritious since it contains both vegetables and paneer ( cottage cheese ). 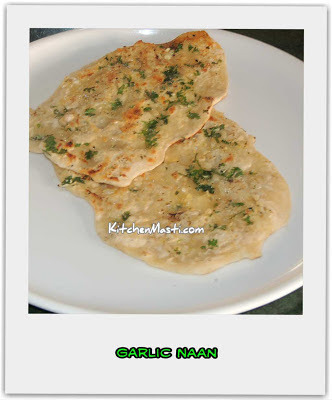 The time taken to prepare this recipe is around 30 minutes and the quantity mentioned here is enough for 4 servings. Beetroot - 1 small sized. Maida ( all purpose flour ) - 1 1 / 2 cup. Wheat flour - 1/ 2 cup. Curds ( yoghurt ) - 2 tbsp. Paneer ( cottage cheese ) - 250 gms. Coconut scrapings - 1 tbsp. Salt - 1 / 2 tsp. Peel the outer layer of the beetroot and grate it into fine pieces. Grind it in the mixer jar adding 1 / 4 cup of water. Take maida and wheat flour in a bowl. Add salt, curds, cream, oil and beetroot puree to the flour. Knead the flour into a soft dough without adding any water. Add grated paneer, green chillis, coriander leaves, coconut scrapings, lemon juice and salt in it. Prepare small balls out of the dough and roll out small 4 inch sized small circles. Place a small portion of the paneer stuffing inside the circles and bring together the edges of the circle to the centre and seal them. Dust the balls with flour and roll out into 6 inch circles. 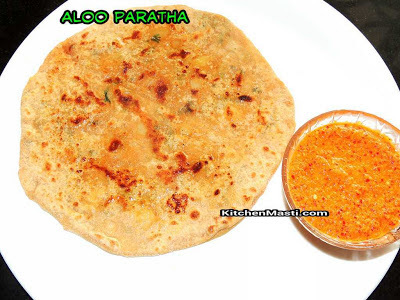 Heat a skillet or a tawa and roast the parathas on both the sides with ghee till brown spots appear on them. Transfer them on to the serving plates. Your pink and appealing paneer stuffed beetroot parathas are ready to be served. !!!! Rest the dough for 30 minutes after kneading it to get a soft paratha. Roast the parathas with butter for a richer taste. Be cautious while kneading the dough. Add water only if it is necessary. See to it that the salt is not in excess since you are adding it while kneading the dough and also for the stuffing. 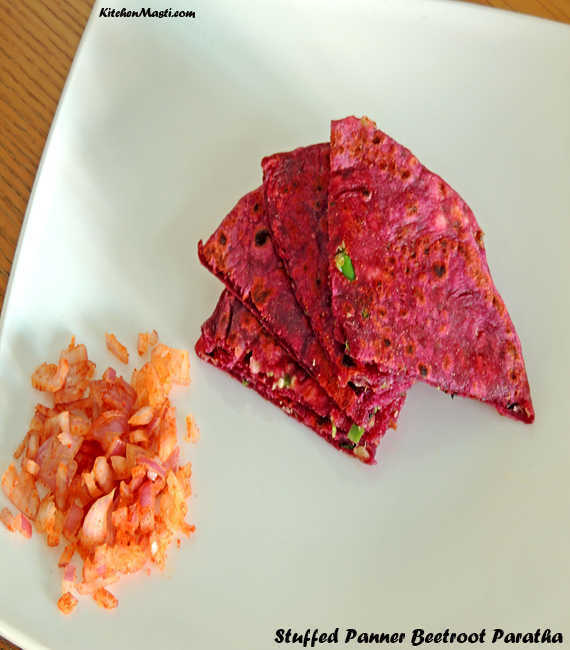 You can eat this beetroot parathas with garlic chutney and enjoy it.